The iDroid Project with the goal to fully port the Linux kernel and the Google Android OS to Apple’s iDevices has got good response from iPhone user community. With the utilization of ‘OpeniBoot’ bootloader it is now possible to run android on iPhone 3G, 2G & iPod Touch 2G. With the help of Bootlance iPhone app you can now install iDroid & OpeniBoot without the need of a computer. 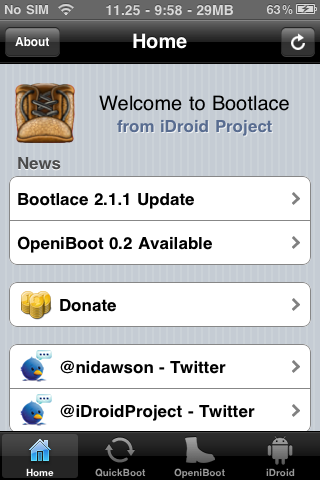 The good news is Bootlance has been updated to 2.1.1 which brings OpeniBoot installation support to iPod Touch 1G. If you are planning to install android on your iPod Touch 1G then do make sure it is jailbroken with Redsn0w, Blackra1n or Pwnagetool. Blacklance 2.2.1 is available for free download in Cydia repository.